Agraria is a San Francisco-based company founded over 30 years ago. Its most famous fragrance is Bitter Orange (a best-selling potpourri, and now available in many home fragrance and body products). Bitter Orange is a favorite of mine: a nose-tickling, slightly powdery fragrance containing clove, bitter orange and cypress. I thought it was time to sample another Agraria scent. Most home fragrance fiends have probably succumbed by now and tried a perfume-oil-with-diffuser-reeds product. Agraria’s Balsam AirEssence comes in a beautiful, hand-blown heavy crystal perfume bottle with glass stopper. 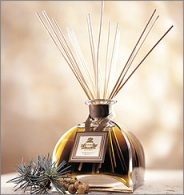 The bottle (almost six inches tall) contains 9.4 ounces of scented oil into which one places 20 nine-inch diffuser reeds. The reeds absorb the fragrant oil and diffuse it into the air; when you want more concentrated scent — flip the reeds. The Balsam fragrance (as described on the Agraria website) contains: sweet balsam (no particular plant/tree is specified), California redwood, French sage, and white flowers (again, no specifics). Diffuser perfume oils are blended in a way that provides a steady stream of unvarying fragrance (these oils must endure long exposure to light and air). During the first days of Balsam use, I smelled a strong pine wood aroma, redwood/clove, and a 'green' pine-needle smell. I detected no floral or sage notes. Balsam is a rich, mellow, masculine wood fragrance; over time the scent deepens, perhaps as the lighter elements of the composition evaporate. Setting the bottle away from heat and strong light may help preserve the lighter (greener) fragrance notes. Balsam AirEssence is expensive ($95), but do consider it lasts much longer than candles or room sprays — it scents a room for nine months to a year. If you suspect you will get weary of one scent for such a long time period, or if you want a different scent for each room in your house, you could opt for the Nob Hill PetitEssence collection: four smaller bottles (1.7 oz each) of Agraria’s Bitter Orange, Lemon Verbena, Lavender & Rosemary, and Balsam fragrances ($125 for the set). Balsam AirEssence scents a room in a pleasant, but not overpowering, way. It works especially well in rooms that benefit from constant "refreshment" — bathrooms and kitchens. AirEssence is flammable — do not place it near a candle, fireplace, stove, or theatrical friend who, while smoking, gestures wildly. Agraria’s Balsam won The American Society of Perfumers award for Best Home Fragrance of the Year (2005). Balsam is available in AirEssence, candles, potpourri, cologne, fragrance sheets, burning sticks and bath/body products. For buying information, see the listing for Agraria under Perfume Houses. Nice review, thanks! I love the scent of Agraria Balsam, though it smells very seasonal to me (think Xmas tree). I'd probably opt for the set of minis and circulate them through the seasons. Balsam does smell like winter; even Bitter Orange reminds me of the holidays (between Thanksgiving and Christmas — must be the clove and orange combo. I just got the Balsam cologne from Beautyhabit, and I'm in total love! It's one of the most comforting scents. My next purchase will be the candle, I think. Thanks for your review! The reed diffusers I have smelled must have been old or of poor quality, because I can barely smell anything. Bitter Orange sounds marvelous – the sort of scent I'd love, but more throughout a room and not on my person. I have a theatrical friend (or family member) or two – very funny!